I have talked with, listened to, and read about how many older women are searching for a way to afford their own home. For many of us, over the age of 55, owning a home seems out of reach. There is also a severe shortage of affordable rentals for older women. There are subsidized apartments for those who are over 62, but the waiting lists are long, and while I see news pop up constantly about senior apartments that are being built, those apartments are financially out of the reach of many of the women who are baby boomers. Also, they don't help women who are between the ages of 55 and 61. Yes please. I love this. I love the tiny house movement. I have reached an age where I just don't need all of the things I have had in the past, but I have found that most of the small space homes have lofts, which I know I will not want to climb up to as I age, or are still very pricey. I am hoping that there will be more floor plans that will accommodate the needs of older women. I recently came across these tiny houses that are being built in Serenbe in Georgia. Serenbe is an upscale community not far from Atlanta that focuses on well being. I have visited there a couple of times and love it. 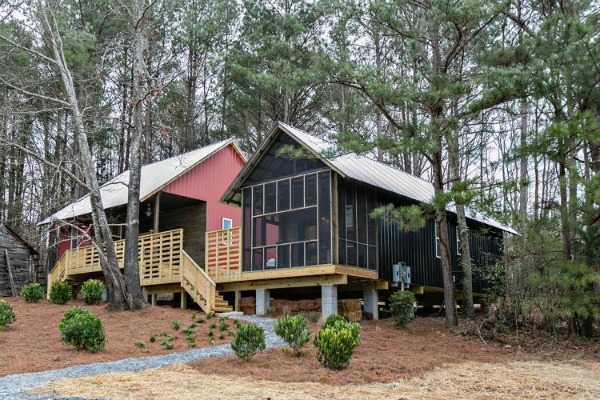 Architecture students at Rural Studio, at Auburn University, wanted to design homes that someone living below the poverty line could afford, that anyone would want, and that would provide a living wage for the construction workers. The materials for each of these houses cost just $14,000. The actual houses cost $20,000. Although these houses are prototypes, they are working on how to get them out into the marketplace. I think these are wonderful and can see them having a wide appeal for older women. You can read more about them here. I would love to see small communities of these houses, for women, where there are communal gardens and a sense of community. Communities where women can be proud of their homes. Communities where friendships are formed. 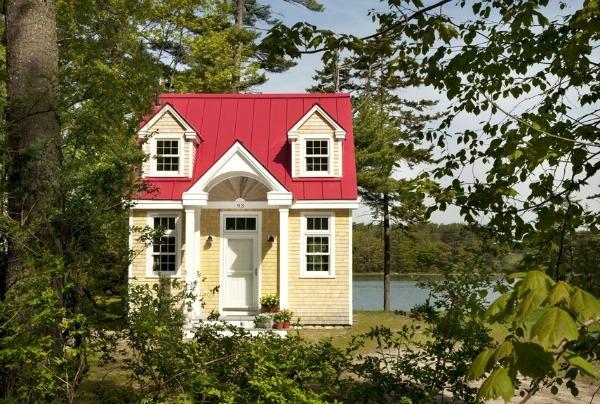 What are your feelings on these small homes? Can you see yourself living in one? P.S. Find more on small space living here. These are SO appealing to me, Laura, especially now when it's two of us, a dog and a cat in a way-too-big house with so much upkeep. Aren't these just fun! Thanks for the post today. I love this concept. I too would love a tiny house but can't do the lofts. The one with the screened porch is pretty darn perfect. A community of tiny home would be amazing. I love that screened porch. That is the thing I miss most about my house in North Carolina. I spent so much time out there. You know that I want to see little communities for women. I will be 59 later this month, and as you said, there is little for women like me until I turn 62, and then the long waiting lists. This is a big problem, growing ever bigger due to the Baby Boomers aging. It really needs to be addressed. I agree, most tiny homes have lofts, so they aren't practical for women our age. It really does need to be addressed, Brenda. There are so many of us who are "economically challenged". The apartment that I will eventually be moving into is 550 sq feet. I think it is the perfect size for me at this point in my life. I think they are cute and perfect for one person to live in! I have never been to Serenbe in person, but have seen lots of pictures of it. It's a beautiful community! You should go, Kelly. I love it. I have been a couple of times and my daughters took me there for my birthday dinner once. Hope you're doing great, Laura! You are definitely not at a stage of life where these would work for you, Marie. Sounds like your home is North Carolina is perfect for your family. It is wonderful to here from you. 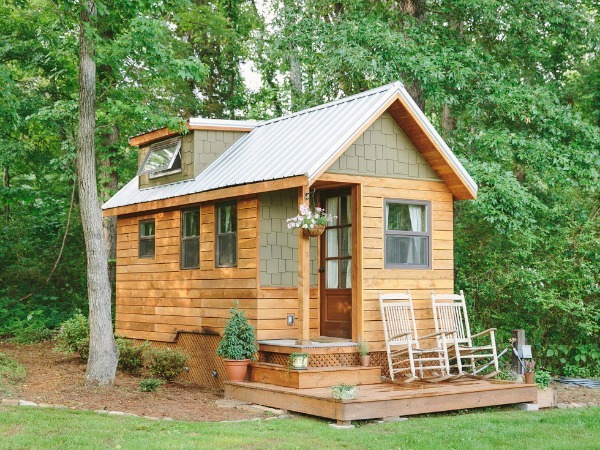 I love the looks of these tiny homes and the practicality especially for those with a limited budget. I do think for myself, at this stage of my life and slowly purging my 'stuff', that I might go a bit stir crazy in such a small space. The idea is catching on here in Canada too, but would be more costly as the homes would need lots of insulation and a good heat source for the winter. I hope this trend will grow though and be available for lower income people. There are some really sweet designs out there. Have a good week Laura. Hi, Pamela. You would definitely need more insulation where you are. I really hope these catch on, too as there are a lot of older women who would love to have their own little home but just don't have the income for a larger space. I would love to see communities of these popping up. What a great concept, perfect in the mountains too! Are you considering moving into one of these? I think they're a great idea...let's please move away from those McMansions! Personally, I couldn't go TOO small, especially living with my husband, as I do need my own space.